The MG Hugh B. Mott Tennessee National Guard Headquarters was the second of three phases of major campus improvements for the Tennessee Army National Guard at Houston Barracks, Nashville, TN. 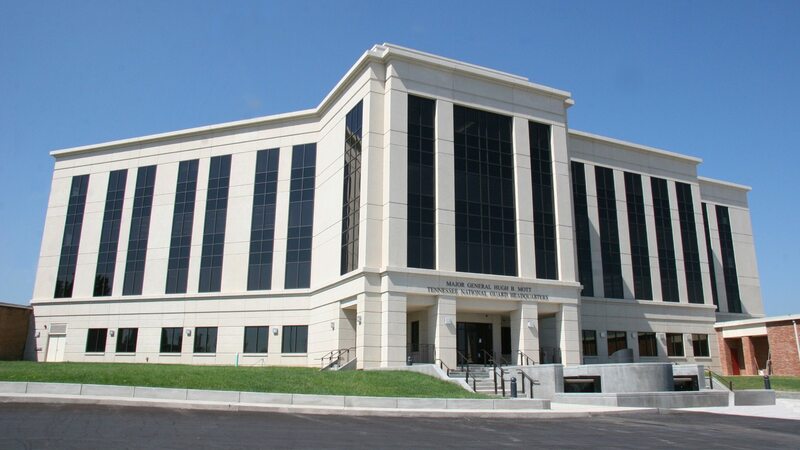 The headquarters is a four-story pre-cast concrete office building of approximately 130,000 square feet designed to combine existing administrative functions for various departments of the Air and Army National Guard with additional offices for the Tennessee Emergency Management Agency in one modern, efficient facility. Communication was crucial on the project, not only among the user departments, but also with the various State and Federal Military construction agencies, while maintaining the complex requirements and security of an active military campus. High-performance glazing allows large amounts of daylight into the building while maintaining an efficient mechanical system. Much of the excavation debris was utilized elsewhere on-site to re-grade a running track around the campus, diverting it from landfills. Programmable lighting system to control lighting when spaces are unoccupied and during non-business hours. Many of the open office areas are designed for flexible configurations due to departments regularly adjusting personnel, size, and space needs.